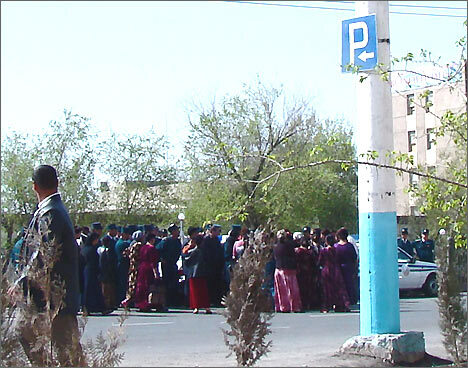 An unprecedented protest action took place in Urgench, the largest city in the Khorezm region of Uzbekistan, on the last day of March. Local vendors numbering nearly 200 (mostly women) protested against transfer of the bazaar to the outskirts and unfair distribution of stalls at the new site. The central bazaars located not far from the site of the protest have been closed since last week. The authorities had said that at least one of them needed reconstruction but the recent session of the regional council of people's deputies resolved to merge both bazaars and permit only foodstuffs on sale there. Local vendors dealing in goods and commodities were advised to move to the newly established bazaar in Karavul, administrative center of the nearby district. The vendors accused the authorities of depriving them of a steady if small income. The authorities claim that only about 500 persons have all necessary patents and permits to sell anything at the bazaar while vendors there actually number 2,000 or so. Exact figures are unavailable of course, but observers believe that the bazaar where goods and commodities were available provided jobs and income for nearly every tenth resident of Urgench whose population stands at 130,000. Protesters proclaimed rent of the stalls at the new bazaar as too high and said most of the stalls there had been already bought by wealthy traders and their clans. "I'm here with my two kids," a young woman told Ferghana.Ru. "Will the khokim [the head of administration] feed them now or what?" 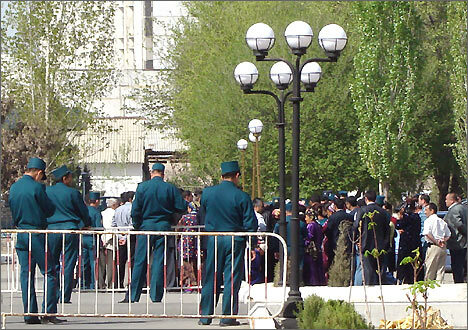 Protesters initially intended to march to the khokimijat [building of the regional administration] and meet with the Khorezm khokim there. The march, however, only made as far as the Kengash [council] building nearby where the police had formed a line and were waiting. Servicemen of the special police detachment or SOBR were unarmed but wore steel helmets and bulletproof vests. Law enforcement agencies were out in force, their officers (in uniforms and plainclothesmen) actually outnumbering the protesters. Police cordons paralyzed traffic in this part of the city. Pedestrians were politely but firmly advised to take a different route to whatever they were walking. Tension mounted when the protesters grew excited upon hearing that one of the vendors had been battered or even murdered by the SOBR this morning. There was nobody present capable of confirming the rumor or denouncing it, though. Asked "What is happening? ", a police officer in one of them cordons came up with a placating "Just a drill." Fortunately, no harsh measures turned out to be necessary. Mayor of Urgench Bakhrom Allabergenov (Khorezm khokim's namesake) agreed to meet with the protesters and even appeared outdoors... only to discover to his disappointment that the protesters wouldn't even listen to him. Protests began to wind down in early afternoon. The police had managed to divide the crowd into several parts and wouldn't let them merge together again. Some protesters decided that "there is no use wasting time here" and set out for the local TV station in the hope to find Radio Ozodlik (RL Uzbek Service) there or en route. There was nothing extraordinary about the protests in Urgench because similar conflicts regularly rock other Uzbek cities.